Mindfulness is a buzzword that is used by many nowadays. Mindfulness is simply focusing your awareness on the present moment and be non-judgmental of your thoughts, feelings, bodily sensations, and etc. Even though mindfulness has its roots in the Eastern Buddhist religion, it is used in both psychology and spirituality. 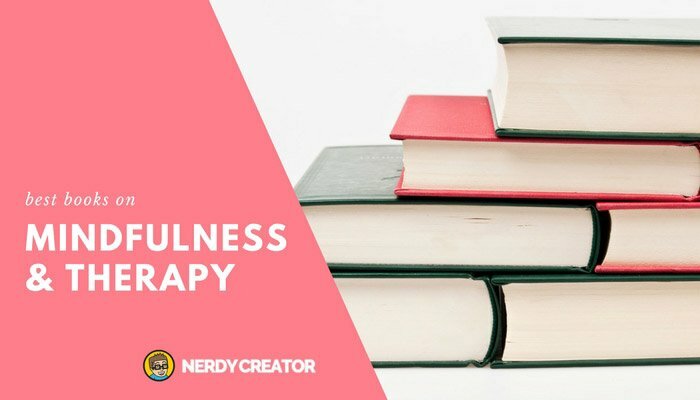 In this post, you will find books on therapy and psychology that based on mindfulness. Unlike spiritual books, these books often focus on treating a specific mental issue or healing a psychological disorder. They tend to be based on science and research. If this isn’t what you are looking for and you want mindfulness books that are rich in spirituality, click here instead. If not, find a book below that helps you resolve the challenge you are currently facing. Instead of suppressing our self-loathing thoughts, this book is about making peace with the constant chatter. Most of our thoughts are conditioned by the past and they occur automatically. But that doesn’t mean you have to believe everything that your mind tells you. You can reduce your suffering tremendously when you practice mindfulness and be skeptical of your thoughts. This book is beneficial for anyone who has a noisy mind. Based on the author’s renowned Mindfulness-Based Stress Reduction (MBSR) program, this book is a good guide for facing the worst things in life and reducing stress. It touches on various types of stress that a person might face such as people stress, work stress, and world stress. As per the author, mindfulness is a moment-to-moment non-judgemental awareness. And all of us have the capability to be mindful, we just need to cultivate it. The author shares many stories in the book, including stories from his Stress Reduction Clinic. The book is suitable for someone who wants to read something that is both practical and narrative. This book is about finding peace and contentment in a frantic world. If you want to free yourself from anxiety, stress, unhappiness, and exhaustion, this book will help you do so. Based on Mindfulness-Based Cognitive Therapy (MBCT), the authors provide an eight-week mindfulness program that helps you rediscover your peace. In the book, you will find different forms mindfulness meditation that only takes you a few minutes a day to do. The authors provide clear, guided instructions, so you can incorporate these meditations easily into your daily life. Mindfulness isn’t merely a good idea, it’s a practice. This book will help you make mindfulness your new habit. Based on Acceptance and Commitment Therapy (ACT), this book challenges your beliefs about happiness and the need to get rid of your negative feelings. The ACT is a therapy that uses acceptance and mindfulness strategies, together with commitment and behavior-change strategies. Its goal is to help you increase your ability to adapt to a situation with awareness and take effective actions. This is also known as psychological flexibility. If you are someone who has troubles with unwanted thoughts and feelings, instead of getting rid of them, read this book. This book teaches you how to be more mindful and how to manage your thoughts processes. This book is based on Dialectical Behavior Therapy (DBT). DBT is a combination of CBT (Cognitive Behavioral Therapy) techniques and Buddhist mindfulness practices. If you find it difficult to cope with intense emotions such as anger, hurt, grief and worry, this book is for you. It offers practical and easy to implement strategies to help you manage emotions effectively. Apart from behavioral techniques, the author also includes mindfulness exercises to help you accept and let go your emotions. This book is very reader-friendly with many examples, so anyone will be able to understand the concepts easily and apply the techniques to their life. Is there something from your past you can’t let go of? Are you always critical towards yourself? Or do you always blame yourself for making mistakes? If so, this is the book for you. This book encourages self-love through being kinder to ourselves. Instead of resisting and avoiding the pain we are feeling, this book is about accepting your thoughts and emotions without judgment or self-blame. Reading this book will help you practice mindfulness and self-compassion. It will help you live more fully in the present moment. Written by someone who specializes in mindfulness and compassion-based psychotherapy, this book is most suitable for those who are suffering from intense emotions and childhood trauma. If you have been trying to “think” your way out of depression, this book suggests otherwise. Written specifically for people who have depression, this book uses strategies drawn from both Eastern meditative traditions and cognitive behavioral therapy (CBT) to help you reduce your symptoms of depression. Mindfulness is about noticing your thoughts without reacting to them. This book helps you identify the thought patterns that contribute to your feelings of depression. It’s also good for people who have low self-esteem and are constantly caught up in negative thinking and rumination. If you are a chronic worrier or your mind feels like a burden, this book is for you. Written by a Buddhist psychotherapist, this book provides both mindfulness strategies from Buddhist spiritual practices and proven psychological techniques. It’s more suitable for readers who are open to both spiritual and psychological perspectives. However, this book is non-technical, so anyone will find it easy to understand. Rumination, when left unchecked, is likely to lead to depression and anxiety. For people who can’t stop overthinking about the future and the past, this book will help you to find contentment in the present moment. If you are doing Mindfulness-Based Stress Reduction (MBSR) program and you need a workbook to guide you, this is the book for you. Apart from providing mindfulness techniques and skills, this book also contains many exercises and questions to get you reflecting on your situation. There is space for you to journal your thoughts. And it also includes a CD with guided mindfulness meditations for auditory learners. This book is suitable for people who seek relaxation and need help with any types of stress such anxiety, PTSD, and low self-esteem. It also helps people suffering from chronic illnesses and pain to get some relief. For those who plan to teach mindfulness too, this book will give you the structures to prepare and organize your lessons. DBT is initially developed by Marsha M. Linehan to treat borderline personality disorder, a mental illness characterized by unstable moods and behaviors. But now, it’s extended to treat people who feel overwhelmed by emotions and distress too. Not only will you learn mindfulness in this book, you will also learn how to handle distress, regulate your emotions, and being effective in dealing with interpersonal relationships. All four aspects are important in developing the DBT skills. As this is a workbook, it’s more helpful for readers who are willing to do the exercises. It’s suitable for those already doing DBT with their therapist. But this book can also be used by anyone who has difficulties handling their emotions. As what the title suggests, this book focuses on neuroscience and its connection to the teachings of the Buddha. If you are someone who is fascinated with brain science and facts, this is the book for you. Not only does this book offers techniques to increase relaxation and awareness, it explains to you how these mindfulness techniques work with our physical neurological systems. It’s definitely a book for readers who want to understand how their brains work. When you change your brain, you change your life. Reading this book will help you to reprogram your brain and create more positive experiences in your life.